We all possess a multitude of paraphernalia in our homes, and some of us have more than others. Regardless, of how much you own, there are somethings that we really don’t want to display or have on show. 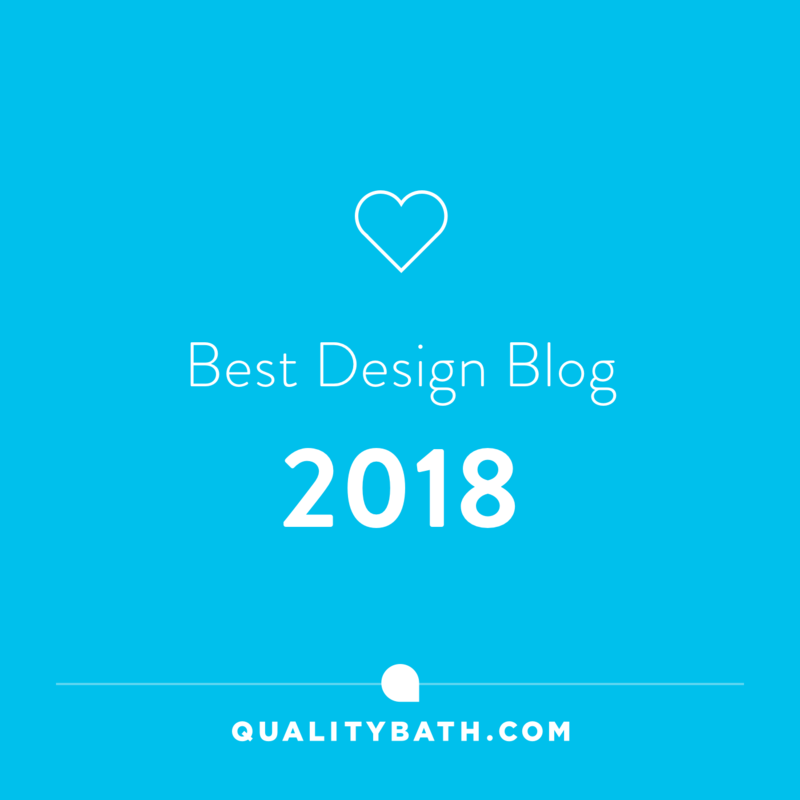 It may be that there isn’t the room for that sideboard or drawer unit, or you are just looking for a less obvious solution to keeping your home clutter-free. Choosing clever storage not only provides you with a clean clutter-free look, it can also provide you with clear spaces to show off what you do want to display. So without further ado, let’s read on for today’s inspiration for 10 Clever Hidden Storage Solutions. 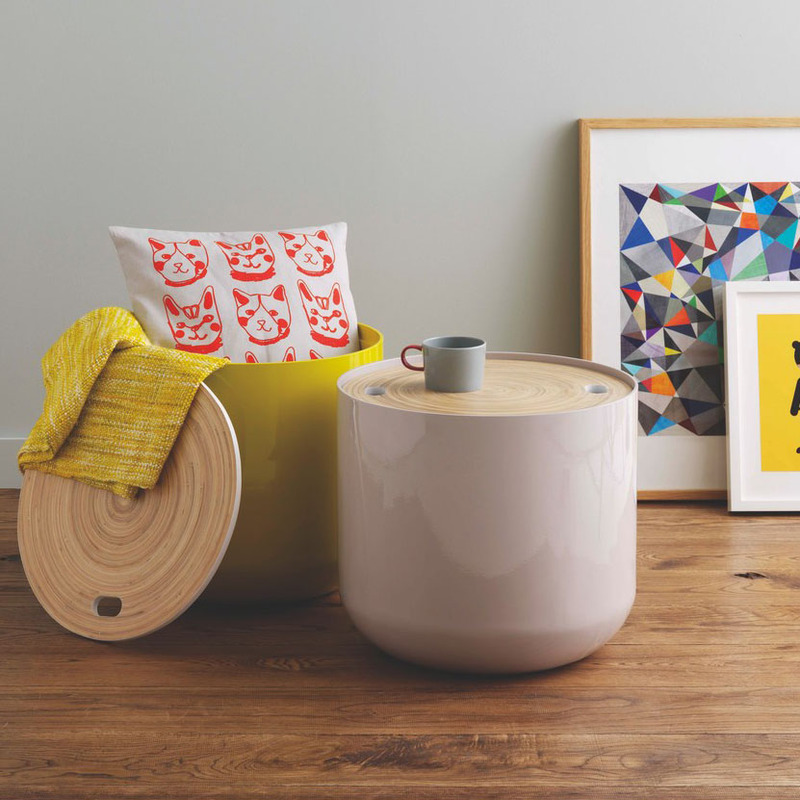 The stylish Blyth mushroom small side table has the perfect solution to a clutter-free room. I particularly the contrast between its glossy base, and the bamboo veneered lid. Great for contemporary styled homes. It would also look great in a bedroom or office. There are a variety of colours to choose from too. Good To Know: Price £95 D48 x H43cm. Made from: Base: plastic. Lid: spun bamboo veneer. 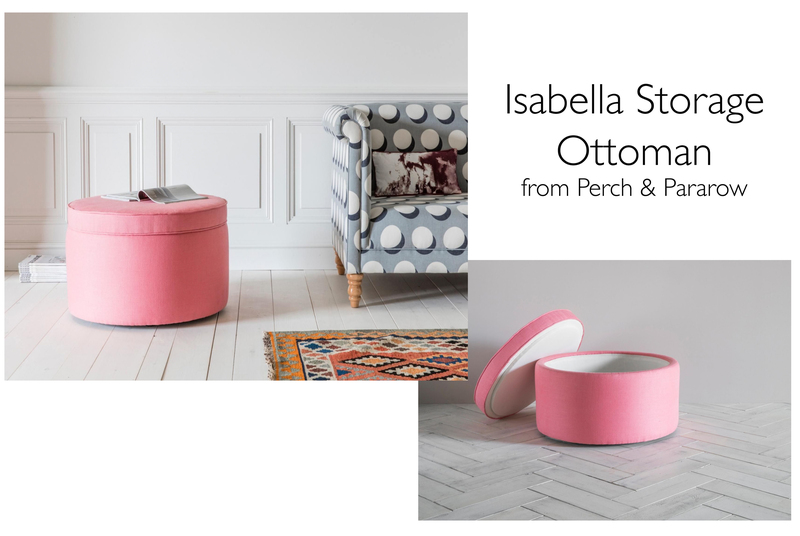 This simply designed ottoman from Perch and Parrow is a versatile piece to own. Not only can you store away a multitude of living room paraphernalia, it also doubles up as additional seating, particularly great for those extra visitors this coming Christmas. There are 130 fabrics/colours to choose from too, including those lovely grey neutrals. Personally, I am loving this peony pink it adds a pop of colour and personality. On its own or in combination, this bedside drawer simply fixes to the wall. Again its a multi-functional piece of hidden storage, and shelf combo. If you choose the untreated version you can incorporate this drawer beautifully with your rooms colour palette. 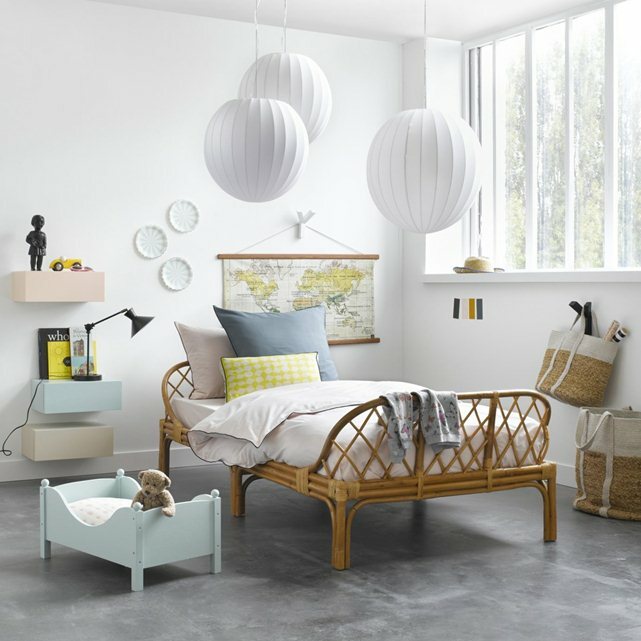 As you can see from above, it is a great choice for children’s rooms as they can hide away at least some of their bits and pieces. 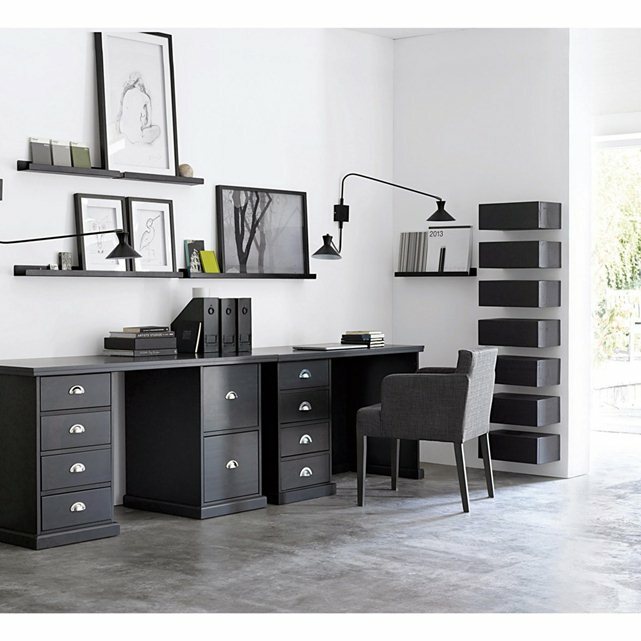 I also love how versatile these Vesper drawers can look as you can see from the home office space below, where they have been grouped on the vertical to create a completely different hidden storage system. Good to Know: Price £49 each. Dimensions: Length 40 x depth 25 x height 15 cm. Untreated suitable for painting although there are two other finishes to choose from. This Abbie storage sofa may just be the perfect solution to your small spaces or if space doesn’t allow a guest room, you can easily put up family or friends for the night. 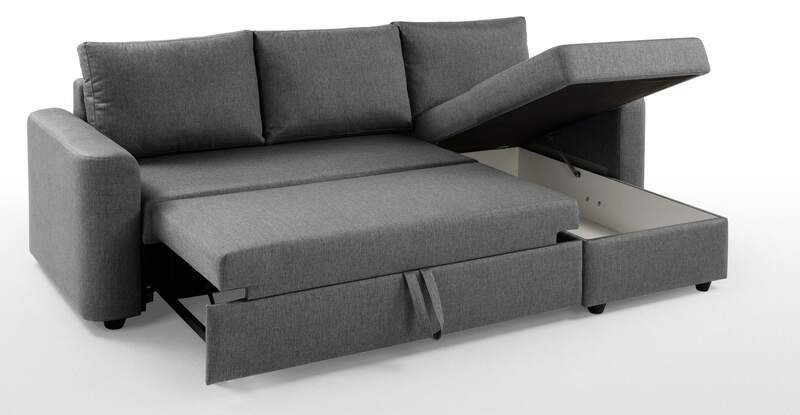 The chaise at the end is also a spacious storage compartment, which is handy for extra bedding. 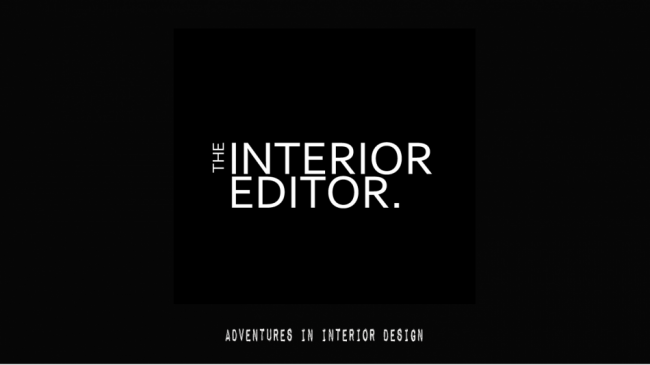 It’s a modern European style ideal that has been developed here in the UK. 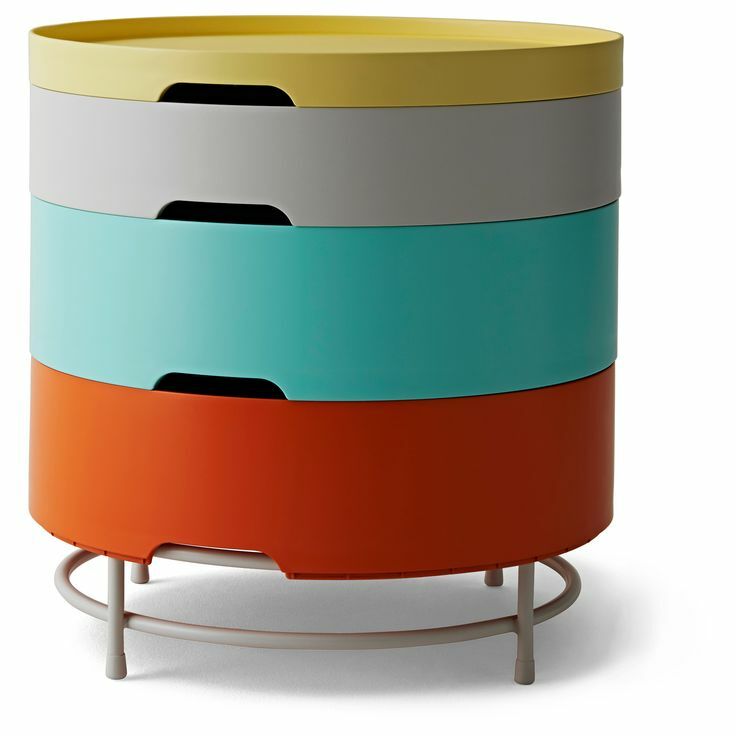 This brightly coloured and versatile side table from Ikea has been around for a while now, which shows it’s popularity. I am thinking children’s bedroom for its colourfulness. I know my youngest would have it filled with the multitude of Lego pieces he owns. The trays have different depths so you can use them to serve or store different types of things. 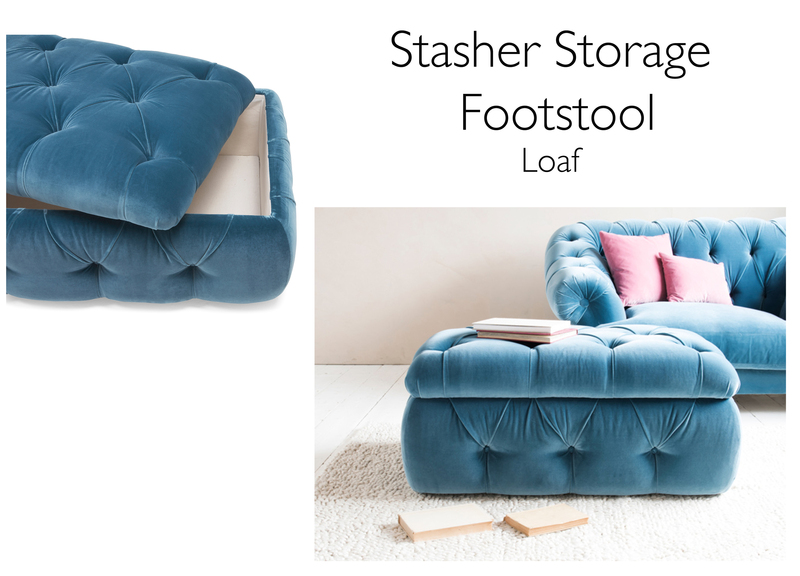 Velvet is a beautiful rich texture to add to your homes right now so I couldn’t resist adding this beauty of a footstool that also provides some handy hidden storage. The lid is completely detachable which does help if you have larger items to store such as blankets and books. Mirrors are great for reflecting light and making our spaces appear larger than they actually are. 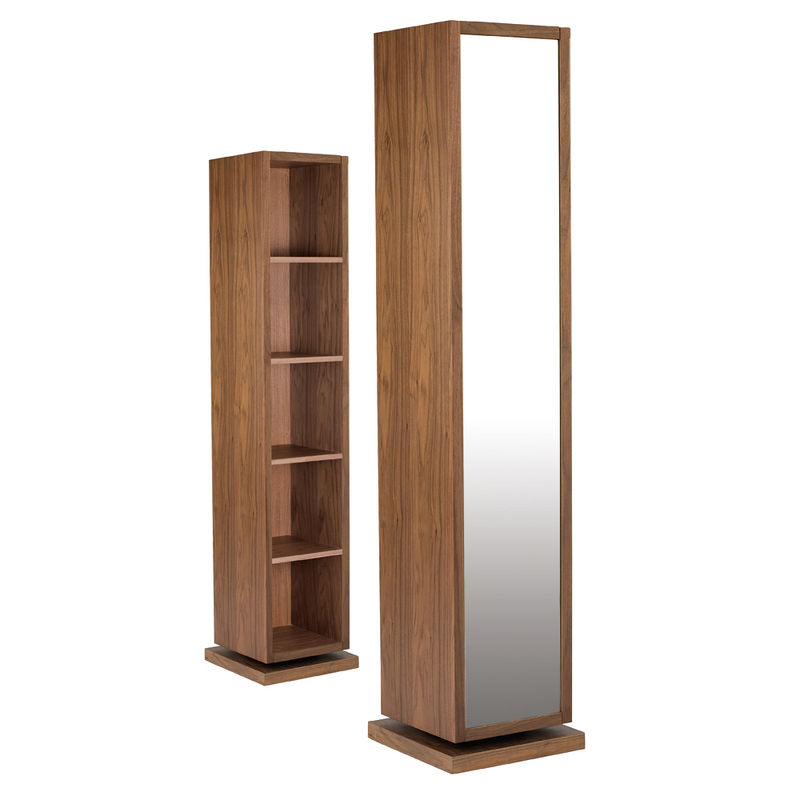 When combined with hidden storage, you know you are on to a winner such as this rotating freestanding mirror from Dwell. Think hallways and bedrooms for keeping them clutter free. Good to Know: Price: on sale at the moment for £249. Dimensions: h180cm : w35cm : d35cm. Made from: Walnut veneer. 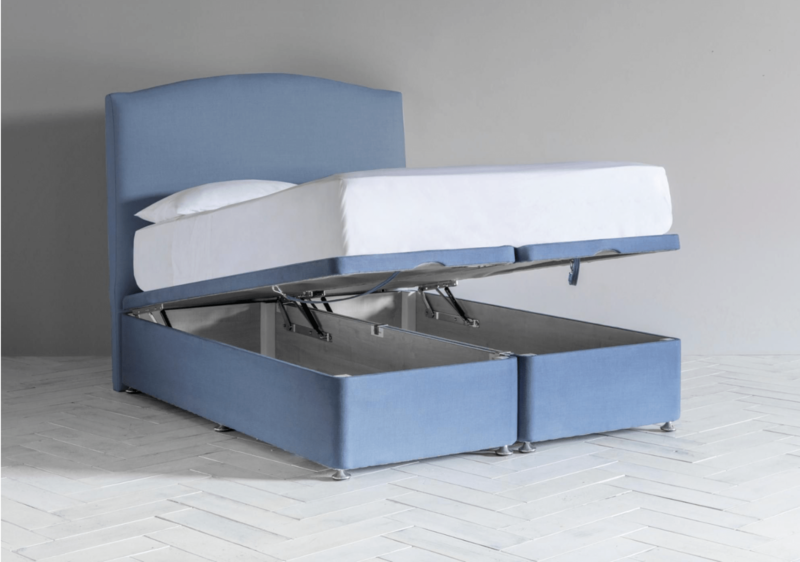 This extremely spacious Dawson divan lifts up so you can store loads of stuff underneath your bed. 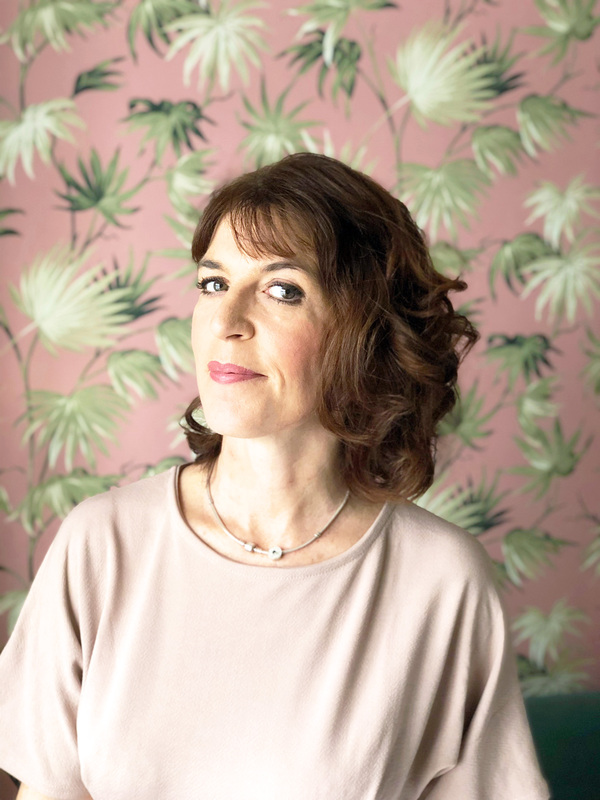 No-one need ever know how many pairs of shoes you truly own, and if you don’t want your partner to know, just don’t tell about the hidden storage. It is also available as a double and king and brilliantly made in the UK with a choice of 5 fabrics. Benches are great for additional seating and look great practically anywhere in our homes, from hallways, living rooms, dining areas, to bedrooms, you just can’t beat them. 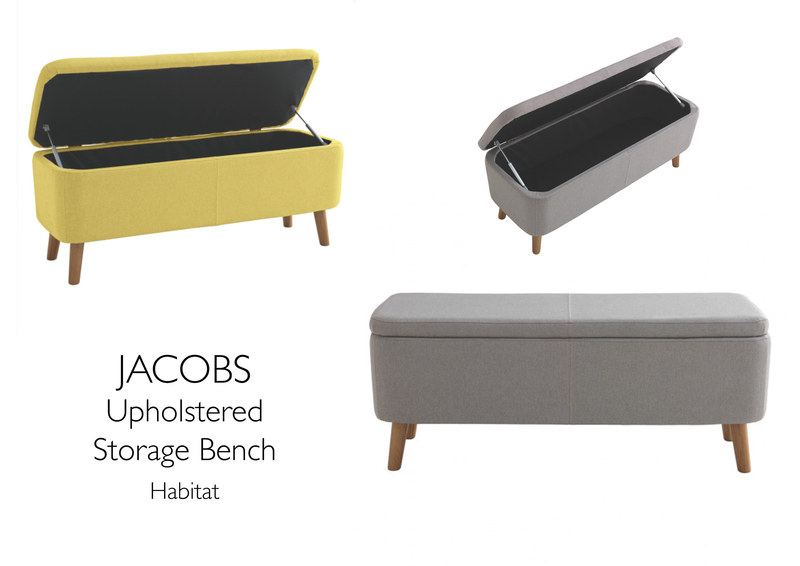 The Jacobs is from Habitat, and I am loving its simple, unobtrusive design which offers more flexibility. Visitors will ever know you have chucked everything in it before they arrived. A variety of colours are available too. Good to Know: Price: £195 although on sale at the moment for £155. Dimensions: W110 x H44 x D40cm. Made from: Cover: 100% polyester, Legs: solid oak, Foam padded seat. The Irma coffee table has a lot going for it don’t you think? Sleek looking, with flexible functionality. A workstation, coffee table and hidden storage, perfect for small living spaces. You may even decide to eat your dinner of it. Good To Know: Price: £665. Dimensions: L113 x H36 x D79 cm.- Useable drawer dimensions: L52 x H6 x D26.5 cm. Made from: oak veneered MDF and charcoal stained MDF with solid oak legs. I hope you’ve enjoyed today’s inspiration for hiding away your clutter in a less than obvious way that also helps when space is tight. Until next time, thanks for stopping by and taking time out to read today’s post. One can certainly never have too much storage. Love how sleek the two end tables are.